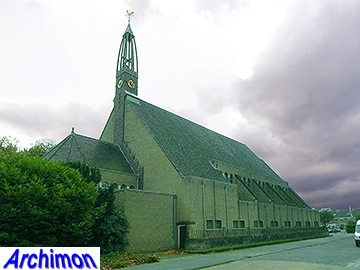 When in the early 1920's Apeldoorn expanded its territory in southern direction, in this new neighbourhood a second catholic parish church was planned that also included the villages Beekbergen and Ugchelen. 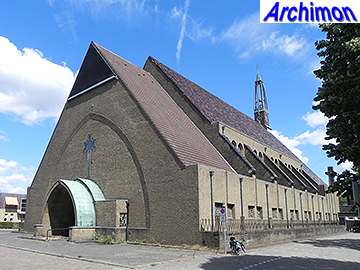 Several architects were invited to present their ideas. 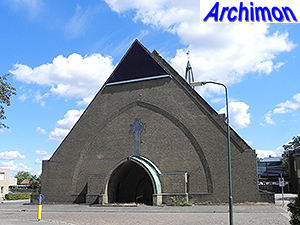 Among them was Jan van Dongen, a young architect from Breda who would soon become Apeldoorn's most notable architect. 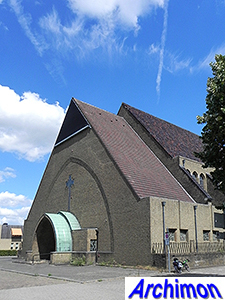 His first design was far too unconventional for that time: the ground plan had a trapezoid shape that became wider towards the choir. 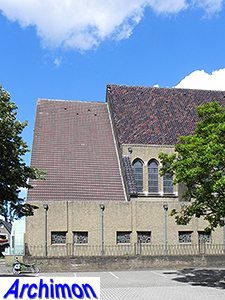 The nave was to be covered by a series of eight roofs of increasing height, while the choir would be crowned with a tall tower covered with rooftiles. 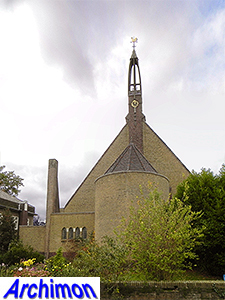 This design was rejected by the archbishop of Utrecht, but Van Dongen was commissioned to build the new church using a much more moderate design. 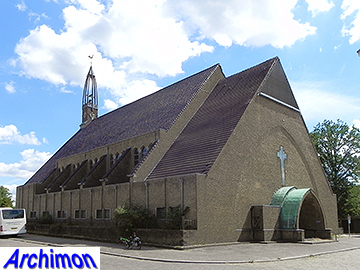 The final, and accepted, design shows a church with a rectangular, basilican groundplan, with only one roof of constant height covering the nave, and one slightly lower covering the portal and organ tribune. 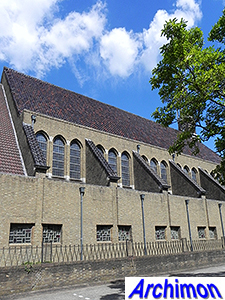 Many attributes of the original design were largely retained, such as the facade, the choir, tower excluded of course, and the side-aisles. 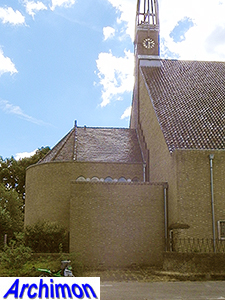 Although not nearly as radical as the original design, the church was an innovation in its own right, being the first multi-aisled church in the Netherlands without pillars. 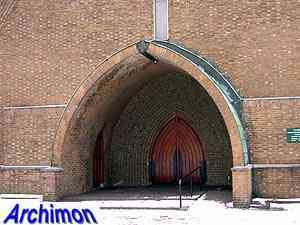 Instead of using pillars, Van Dongen built a construction around a series of large arches, with the walls built in between. 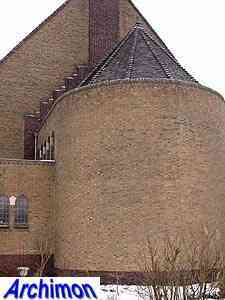 According to some sources, the church was in general modelled after the type of sheep barn typical for this region. 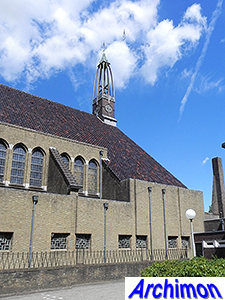 It is a basilica with a wide central aisle with large pointed windows that form a clerestorey, while the much lower and narrow side-aisles only have small rectangular windows. 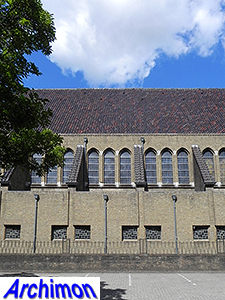 The eastern part of the nave has no windows at all, thus emphasizing the well-illuminated choir. 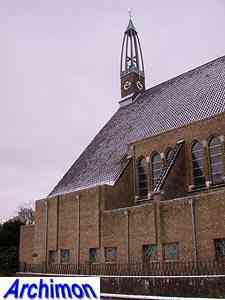 On top of the eastern part of the nave is an open, parabolic tower. 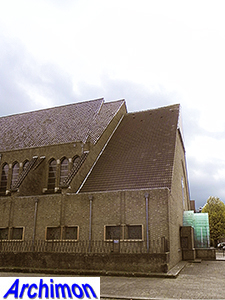 More light enters the church through a large crucifix-shaped window in the facade. This crucifix is positioned within a large, slightly recessed arch, the shape of which is repeated with the portal. 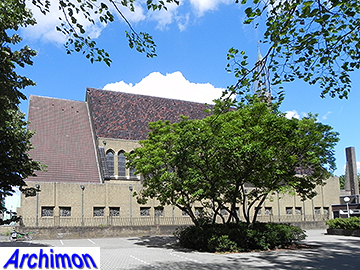 The choir is distinctively lower and narrower than the nave. Although usually ranked under Expressionism, there are elements of Traditionalism as well, like the use of natural stone in the areas around the windows. 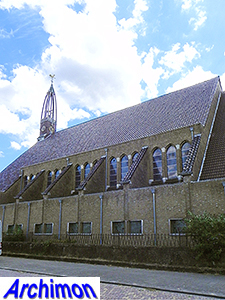 Although its decommissioning had been announced for 2013, the the church was already closed in May 2012, due to its bad technical state. After restoration it will become a day-care centre.